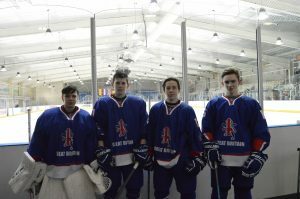 Three Bradford Bulldogs ice hockey players finished the year on a high, after helping the rest of their Great Britain U16 team mates win the IHUK U16s International tournament, at Dumfries Ice Bowl. The GB team beat their last opponents, Spain, in an 11-1 victory. Previous victories were against the Netherlands, 10-5 and Belgium 13-2. Harrison Walker (Net minder), Jacob Lutwyche (Forward) and Jordan Griffin (Defence)were selected for the team earlier in the year. Kieran Brown (Forward), from Bradford but currently playing for Iowa Wild in the USA, was also selected.